Are you one of those people that at the end of the week, just can't figure out where your gold went? Do you want to know what your biggest expenses are? Accountant is an in dept Gold tracking ad don that tels you exactly how much your trip to the auction has cost you, what you spend on taxi costs, what you have earned from quests and many other things. .Accountant allows you to sort your income and expense by Total , Monthly, Weekly, and daily earned gold. You can also check where your biggest income is and what you spend most of your gold on. Accountant includes a "cache box" that will 'hide' gold from the total displayed in the main window or the LDB. It in no way changes the gold you have. The money information will be saved for each character on each realm. You must log in to each character before it can be shown in Accountant. Accountant is Data Broker compliant.. Please use: https://github.com/DJDajn/Accountant/issues for issues, features or comments. Removed Reforging as it was removed from the game. Changed some code to make future upgrades easyer. Auto filling in default vallues for unsaved (new) data. People who are still on 4.09.50100 will also experience a more smooth upgrade. Finaly Implemented Black market tracking, This should also remove the lua error you get when bidding on a black market auction. Note: Since new data is being tracked, You must log in on each character before the addon works. The data needs to be writen to the saved values before it can track again. If you still have characters tracked that have already been deleted, you must remove your WTF folder. - Open mail from the auction house and close but do not pull the gold out. Then open the mail again and pull out. The gold will go into the Mail category not auction house (AH). 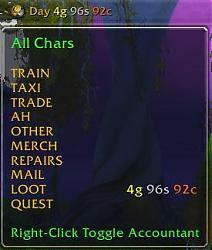 I found this on a recent change to BeanCounter (Auctioneer). It opens mail to get info and leaves the mail as 'read'. This makes it 'hidden' to other addons. Blizzard has no way to change mail state ('read' to 'unread' for example). - implemented the black market for gold tracking. 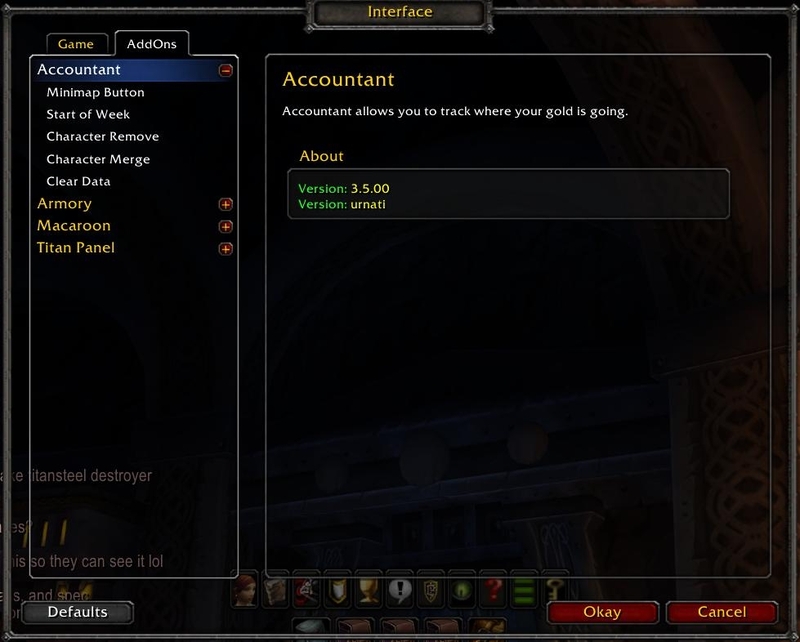 - Fixed the botched fix for calculating gold when gold is made / lost offline (web AH). - Fixed error calculating gold when gold is made / lost offline (web AH). - Fixed an error when someone has too many characters saved. Accountant only shows 15. - Small change to prevent errors when selecting session/day/week tabs. - Added check for gold change on new session. Changes are put in "Unknown". For example you use the web AH or you use another system to play WoW. - Changed server lookup to allow "(" in server name. e.i. "Blizz_Server (US)"
- Add new option to show total on LDB button. 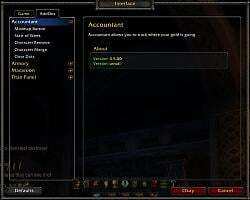 the Accountant frame or Accountant LDB button is affected. This was updated at the request of a friend. Accountant appears to be currently unsupported so a new version was required. Updated version can now be downloaded either here or via the twitch client! 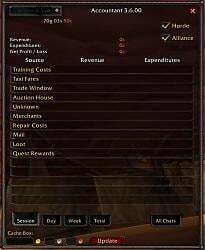 Is this going to be updated for BFA? I'm not the or any addon author but I got it back to working. I don't know if I can upload files but these changes are easy to make. In Warcraft/Interface/Addons/Accountant, open Accountant.lua in a text editor. 1. On line 854, change "TRADE_CLOSE" to "TRADE_CLOSED". 2. Around line 890, change "GARRISON_SHIPYARD_NPS_OPENED" to "GARRISON_SHIPYARD_NPC_OPENED". Hi, I got permission from the previous owner to continue the updates/development and I'll have a updated version for 8.0.1 later either later tonight or tomorrow. Thank a lot for that 7.3 fix, it makes my life a lot easier. Now I am having an issue with the addon not being able to handle all my characters, i tryed to play a while with the code but coulndt fix it myself, anyone being able to have more than 15 characters on one server now that the cap has been raise? Hallo there! Since 7.3 rolled out, I've been seeing a wee errmsg whenever I switch tabs in the addon. Lacking time and determination for deeper bug-hunting, I opted to just comment out the call which was causing this one error. You may safely mimic my actions with no repercussions whatever excepting that the sound will not play when switching tabs (it was already broken, hence the errmsg in the first place). Your troubles are solved for now, unless you just have to hear that audio cue, just can't live without it. In that case, dig deeper into the code which the line above calls. The URL for tickets listed on the main page here (and duplicated at the Curse.com page for this addon) is indeed quite out of date. The newest message posted to that venue dates from 2015. Furthermore, there is now (as far as I could find) any way to post new threads there. Complicating matters, urnati does not seem to have been active on any relevant sites since January of 2016. Thorismund has (apparently) not been active here (wowinterface) for some while, although Curse.com shows him active in late August of this year. He may be entirely unaware of any messages posted here subsequent to his latest activity (here). All this raises the question: why does this addon need not one, but THREE sites to present the addon, collect and respond to feedback, etc? This is confusing and inefficent. One addon - one website for managing the project. Simple. Do that, please. Chose ONE. Last edited by ZenZoroaster : 09-17-17 at 12:22 PM. is there anyway to remove the session from LDB? I posted a bug report here because the description link to google code doesn't allow input and appears to be rather old. (*temporary) = "attempt to index field 'options' (a nil value)"
I use this all the time now, great add on. One thing that would be nice is to show daily garrison resources collected and spent/used. The author hasn't replied to the addons Google Code page for "issues/comments" since June of 2014. Last edited by Petrah : 06-27-15 at 02:45 PM. 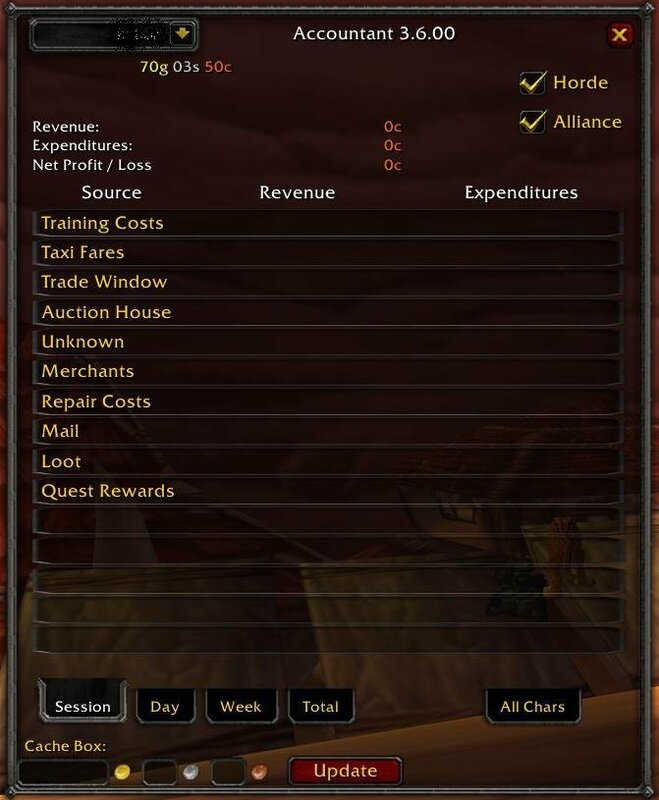 Hi, first time using this addon and it tells me I have revenue from taxi fares? How come? Also it logs a lot of the gold I pick up from the mailbox as coming from mail not from auctions which is the actual source of the gold. I'm using the Postal mailbox addon. Perhaps there is some conflict between the two? Any help to straighten this stuff out? Thanks. Edit: Just noticed it's a known issue. However it was showing me revenue from taxi fares, but upon a relog it doesn't show it anymore. Last edited by ameer : 01-28-15 at 05:15 PM.